Richard Parkes Bonington (1802-1828) is the painter most often credited with bringing the English watercolor movement to Europe in paintings of great technical command and color lyricism. The only son of a Nottingham drawing master and stationer, Bonington learned watercolor painting from his father and exhibited paintings at the Liverpool Academy at age 11. His family relocated to Calais (France) late in 1817 to start a lacemaking factory. There Bonington came under the casual tutelage of Louis Francia (1772-1839), who legend has it encountered the boy sketching alone along the Calais docks and beaches. Francia was a French painter just returned from 10 years in London where he had learned the latest developments in British watercolor painting by working alongside Thomas Girtin, John Varley and Peter DeWint; these methods he taught to Bonington. In 1818 the family moved to Paris to open a lace retail outlet, and within a year Bonington had met Eugène Delacroix and English art students such as James Roberts Jr. while copying Dutch landscape and genre paintings in the Louvre. At Roberts's urging, Bonington enrolled in studies at the atelier of Baron Antoine-Jean Gros (1771-1835), then the most prestigious art pedagogue in Paris, and at the École des Beaux-Arts. But he also began landscape sketching tours in the suburbs and countryside around Paris, recording genre scenes of fishmarkets and architectural ruins, and selling the paintings to Parisian art dealers. He first exhibited two paintings at the Paris Salon of 1822; both were purchased by the Société des Amis des Arts, a group of influential connoisseurs. By 1823 he was working closely with Francia (then in Paris) to prepare his own lithographic series on architectural ruins, Restes et Fragmens (Remnants and Fragments); but he also contributed to other architectural publications, studied medieval armor and dress for historical and costume paintings, began painting in oils, and toured northern France with an extended stay in Dunkurque. After the famous Salon of 1824, where he received a gold medal along with John Constable and Anthony Copley Fielding, demand for his work increased significantly. He probably met Samuel Prout at this time. Bonington traveled to London in 1825 where he studied historical costumes in Westminster, met important artists, publishers and art dealers, and toured along the northern coast with Eugène Isabey and Delacroix before returning to Paris to take up lodgings with Delacroix. In 1826 Bonington made a two month trip through Switzerland and northern Italy with a fellow painter, Charles Rivet, composing many drawings and oil sketches but fewer watercolors. In 1827 he made a second trip to London and continued to exhibit and to appear in lithographic publications, and was working strenuously on his various commissions. He made a third trip to London in 1828 and received notice for paintings exhibited at the British Institution for the Promotion of Fine Arts, but collapsed during a sketching tour of the Seine that summer, apparently sick with tuberculosis. His health began to deteriorate rapidly, and he was taken to London by his parents for treatment, but died two weeks after his arrival. Almost immediately from the moment his pictures were publicly exhibited in 1822, Bonington was hailed as a leading talent among the new generation of painters who reacted to the strictures of academic painting that derived from the severe, classicizing style of Jacques-Louis David (1748-1825), the leading artist of the French Revolutionary era. Against this style, which was limited to parables from Plutarch, stiff aristocratic portraits and postcards from the Roman countryside (all rendered with a cold, chiseled clarity called "air"), the new generation favored genre paintings of fishmarkets, fields and local laborers painted with emotion and the "atmosphere" of natural effects of light and weather. So a contemporary would see The Harbor, Le Havre (c.1821, 20x27cm) as innovative for its hazy aerial perspective, commonplace subject matter, and human figures with their backs turned to us. He would also find the painting recognizably English in style and execution  the broad, flat washes and contrast of warm oranges and browns against cool blues closely follows the style of the leading watercolor painters in the English watercolor societies, such as John Varley. 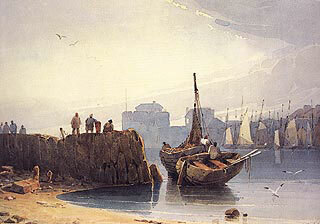 Bonington was impressive too for his technical skill: those light ripples along the shore were not reserved with a resist, or added later with gouache, but were traced by the brush as it laid down the water's reflected colors, including the gradations in tone in the reflections from the top to bottom edge. And the last unique feature of Bonington's style is his remarkable sense for color harmonies, which Delacroix described as gemlike. Bonington contributed to several illustrated travel publications of the era  a staple trade for aspiring artists of the time  and quickly became one of the most popular artists in travel genres. Many of Bonington's landscapes present nature in a mood of timeless peace and unique intimacy. 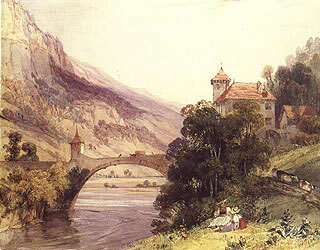 The Bridge and Abbey at St. Maurice d'Agaune (c.1826, 19x24cm) was one of the most picturesque sights along the Simplon Pass route from Geneva into northern Italy  the spot includes a Roman bridge, a 14th century abbey, a hermit's tower and the spectacular backdrop of the Swiss Alps. It was reproduced in nearly every illustrated tour book of the era. Bonington's contribution draws on sketches made during the first week of his trip to Italy with an artist friend. He characteristically brings forward a tranquil and pastoral mood, leading us into the scene with two young women and a placid group of cows, and cleverly cropping away much of the rocky heights on both sides of the river. The palette consists of muted violets and greens, warmed by earth tones in the abbey roof and bright touches of vermilion in the girls' vests. Bonington's Italian trip was made at a furious pace, working up pencil or oil sketches for use in studio compositions. 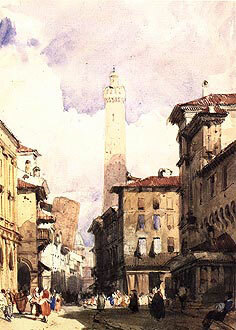 The Leaning Tower, Bologna (c.1826, 23x17cm) adopts the same general format as topographical paintings by Samuel Prout: the historical monument of the title is placed in a secondary role, as a distant background presence to the commonplace street scene of old facades and human traffic. Even though many days of his Italian trip were marked by rainy weather, Bonington gave prominent place to the sky in his Italian paintings  but always a sky filled with massive, rosy gray clouds and peekhole fragments of ultramarine sky. The effect is exalting yet gently enveloping, and gives the human scale in all of Bonington's Italian paintings a delicately miniaturized feeling. The brilliant color notes are limited to the costumed figures at the lower left; the rest of the painting is an abstract value composition in umbers and siennas, built around the three diminishing dark areas (the shadowed facades and street shadows at right and center, and the clipped arch shadow at left) located under the three vertical accents in the line of architecture against the sky. But where Prout's drawings are crusted over with a fussy rendering of masonry and wood, Bonington captures the stucco surfaces of the buildings with rapid, loose brushwork that suggests texture and color without laboring it. This also appears in his rendering of the architectural surfaces: windows are sometimes simply rectangles drawn onto the brown stucco surface, and ledges are indicated only by their shadows. This romantically subjective approach to painting  in which the viewer's imagination is invited to interpret the image from artistic suggestions, rather than dictated to by the unambiguous and authoritative images of academic "air"  was probably the most important innovation brought into European painting by Bonington, Constable, Turner and other English artists, the foundation from which French Impressionism would quickly flourish. Bonington had an immeasurable impact on watercolor painting in Europe, but this impact was a product of the times. The collecting craze for his works in the 1830's was a symptom of the development of the gallery economy, a romantic era fascination with all things English, and the rise of the urban bourgeois art collector; and his style spawned numerous forgeries and imitators of his seascapes, costume studies, and scenes of Venice. Painters associated with Bonington's style include the direct imitator Thomas Shotter Boys (1803-1874), as well as many followers who sometimes rise above the level of imitators: the "late topographers" James Duffield Harding (1797-1863), James Holland (1799-1870), and William Callow (1812-1908). The standard reference for Bonington's paintings is the catalog to the 1991 Yale exhibition: Richard Parkes Bonington: On the Pleasure of Painting by Patrick Noon (Yale Center for British Art, 1991), which superbly summarizes the art trends of Bonington's time and cuts through the layers of myth and legend around Bonington's life. There's a very sympathetic chapter on Bonington in Martin Hardie's Water-Colour Painting in Britain: II. The Romantic Period (Batsford, 1967). A special study of Bonington, his teacher and one of his major followers is in Bonington, Francia, Wyld by Marcia Pointon (Batsford, 1985).